The main centre is the city of New Plymouth. The New Plymouth District has over 65% of the population of Taranaki. New Plymouth is in North Taranaki along with Inglewood and Waitara. South Taranaki towns include Hawera, Stratford and Etham. Since 2005, Taranaki has used the promotional brand "Like no other". Taranaki is on the west coast of the North Island, surrounding the volcanic peak. The region has an area of 7258 km². The large bays north-west and south-west of Cape Egmont are the prosaically named North Taranaki Bight and South Taranaki Bight. 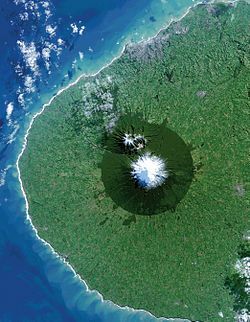 Picture of Taranaki acquired from the Landsat 8 satellite, showing the near-circular Egmont National Park surrounding Mount Taranaki. New Plymouth is the grey area on the northern coastline. Mount Taranaki or Mount Egmont, the second highest mountain in the North Island, is the dominant feature of the region. A Māori legend says that Taranaki previously lived with the Tongariro, Ngauruhoe and Ruapehu mountains of the central North Island but fled to its current location after a battle with Tongariro. A near-perfect cone, it last erupted in the mid-18th century. The mountain and its immediate surrounds form Egmont National Park. Māori had called the mountain Taranaki for many centuries, and Captain James Cook renamed it Egmont after the Earl of Egmont, the recently retired First Lord of the Admiralty who had encouraged his expedition. The mountain has two alternative official names, "Mount Taranaki" and "Mount Egmont". The region is exceptionally fertile, thanks to generous rainfall and the rich volcanic soil. Dairy farming predominates, with Fonterra's Whareroa milk factory just outside of Hawera producing the largest volume of dairy ingredients from a single factory anywhere in the world. There are also oil and gas deposits in the region, both on- and off-shore. The Maui gas field off the south-west coast has provided most of New Zealand's gas supply as well as, at one time supporting two methanol plants (one formerly a synthetic-petrol plant called the Gas-To-Gasoline plant) at Motunui. More fuel and fertiliser is produced from a well-complex at Kapuni and a number of smaller land-based oilfields. With the Maui field nearing depletion, new offshore resources have been developed: The Tui field, 50 km south of Hawera, with reserves of 50,000,000 barrels (7,900,000 m3) of oil and the Pohokura gas field, 4.5 km north of Waitara. The way the land mass projects into the Tasman Sea with northerly, westerly and southerly exposures results in many excellent surfing and windsurfing locations, some of them considered world-class. Taranaki has a population of 110,100 as of Statistics New Zealand's June 2012 estimate, 2.5 percent of New Zealand's population. It is the tenth most populous region of New Zealand. The median age of Taranaki's population is 39.9 years, two years above the New Zealand median. Around 16.2 percent of the population is aged 65 or over while 21.1 percent is aged under 15. There are 95.7 males for every hundred females in Taranaki. Just under half the residents live in New Plymouth, with Hawera being the only other town in the region with a population over 10,000. The region has had a strong Māori presence for centuries. The local iwi (tribes) include Ngāti Mutunga, Ngāti Maru, Ngāti Ruanui, Taranaki, Te Āti Awa, Nga Rauru, Ngāruahinerangi and Ngāti Tama. Around 50.2 percent of Taranaki's population affiliate with Christianity and 2.7 percent affiliate with non-Christian religions, while 43.8 percent are irreligious. Catholicism is the largest Christian denomination in Taranaki with 15.5 percent affiliating, while Anglicanism is the second-largest with 13.5 percent affiliating. The area became home to a number of Māori tribes from the 13th century. From about 1823 the Māori began having contact with European whalers as well as traders who arrived by schooner to buy flax. In March 1828 Richard "Dicky" Barrett (1807–47) set up a trading post at Ngamotu (present-day New Plymouth). Barrett and his companions, who were armed with muskets and cannon, were welcomed by the Āti Awa tribe because of their worth assisting in their continuing wars with Waikato Māori. Following a bloody encounter at Ngamotu in 1832, most of the 2000 Āti Awa  living near Ngamotu, as well as Barrett, migrated south to the Kapiti region and Marlborough. The sub-national GDP of the Taranaki region was estimated at NZ$9.2 billion in 2014, making up 4% of New Zealand's national GDP. As of 2014 Taranaki has the highest GDP per capita of any region in New Zealand. From 1853 the Taranaki region was governed as the Taranaki Province (initially known as the New Plymouth Province) until the abolition of New Zealand provinces in 1876. The leading office was that of the superintendent. The Taranaki Regional Council was formed as part of major nationwide local government reforms in November 1989, for the purpose of integrated catchment management. The regional council was the successor to the Taranaki Catchment Board, the Taranaki United Council, the Taranaki Harbours Board, and 16 small special-purpose local bodies that were abolished under the Local Government Amendment Act (No 3) 1988. The Council's headquarters were established in the central location of Stratford to "provide a good compromise in respect of overcoming traditional south vs north Taranaki community of interest conflicts" (Taranaki Regional Council, 2001 p. 6). The Māori language spoken in Taranaki replaces the sound of h (both on its own and in wh) with a break. (The sound used in adjacent Wanganui is similar but not identical.) Thus the famous elder Hina Okeroa was universally known as Ina. The name of the river flowing through New Plymouth, Waiwakaiho, would be written Waiwhakaiho (meaning "water flowing downward") in central North Island Māori. Taranaki's landscape and the mountain's supposed resemblance to Mount Fuji led it to be selected as the location for The Last Samurai, a motion picture set in 19th-century Japan. The movie starred Tom Cruise. William Douglas Cook – founder of Eastwoodhill Arboretum, Ngatapa, Gisborne and of Pukeiti, world-famous rhododendron garden, New Plymouth. 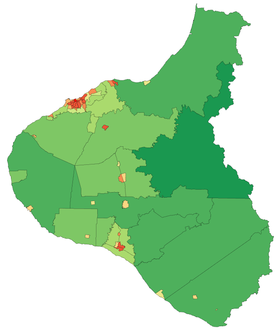 ^ a b c "Subnational population estimates at 30 June 2012". Statistics New Zealand. 23 October 2012. http://www.stats.govt.nz/browse_for_stats/population/estimates_and_projections/subnational-pop-estimates-tables.aspx. Retrieved 23 October 2012. Also "Infoshare; Group: Population Estimates - DPE; Table: Estimated Resident Population for Urban Areas, at 30 June (1996+) (Annual-Jun)". Statistics New Zealand. 19 December 2012. http://www.stats.govt.nz/infoshare/SelectVariables.aspx?pxID=2f5a6aa2-7aeb-4792-a34a-d5567eb8082f. Retrieved 23 October 2012. ^ "Like No Other". New Plymouth District Council. 29 June 2006. http://www.newplymouthnz.com/TaranakiLikeNoOther.htm. Retrieved 25 June 2011. ^ "What is the difference between alternative naming and dual naming?". http://www.linz.govt.nz/placenames/consultation-decisions/a-to-z/whanganui/faq.aspx. Retrieved 19 March 2010. ^ "Fonterra - Whareroa". https://www.fonterra.com/nz/en/about/our+locations/newzealand/whareroa/whareroa. ^ Tui oil field. Nzog.net. Retrieved on 2011-06-25. ^ "Pohokura gas field". Todd Energy. Archived from the original on 2010-05-26. https://web.archive.org/web/20100526072454/http://www.toddenergy.co.nz/te/pro_poh.html. ^ "2013 Census QuickStats about a place: Taranaki Region". Statistics New Zealand. http://www.stats.govt.nz/Census/2013-census/profile-and-summary-reports/quickstats-about-a-place.aspx?request_value=14110&tabname=&p=y&printall=true. Retrieved 28 March 2016. ^ "Birthplace (detailed), for the census usually resident population count, 2001, 2006, and 2013 (RC, TA) – NZ.Stat". Statistics New Zealand. http://nzdotstat.stats.govt.nz/wbos/Index.aspx?DataSetCode=TABLECODE8041. Retrieved 28 March 2016. ^ "2013 Census QuickStats about culture and identity – data tables". Statistics New Zealand. 15 April 2014. http://www.stats.govt.nz/~/media/Statistics/Census/2013%20Census/profile-and-summary-reports/quickstats-culture-identity/tables.xls. Retrieved 29 January 2016. Note some percentages (e.g. ethnicity, religion) may not add to 100 percent as people could give multiple responses or object to answering. ^ a b c Angela Caughey (1998). The Interpreter: The Biography of Richard "Dicky" Barrett. David Bateman Ltd. ISBN 1-86953-346-1. ^ Belich, James (1986). The New Zealand Wars and the Victorian Interpretation of Racial Conflict (1st ed.). Auckland: Penguin. ISBN 0-14-011162-X. ^ Michael King (2003). The Penguin History of New Zealand. Penguin Books. ISBN 0-14-301867-1. ^ Ngati Awa Raupatu Report, chapter 10, Waitangi Tribunal, 1999. ^ B. Wells, The History of Taranaki, 1878, Chapter 25. ^ "Regional GDP, 2014 – Taranaki". Statistics New Zealand. 2015. http://www.stats.govt.nz/browse_for_stats/economic_indicators/NationalAccounts/rgdp-2015-infographic/regions/taranaki.aspx. Retrieved 14 February 2016. ^ "Regional Gross Domestic Product: Year ended March 2014". http://www.stats.govt.nz/browse_for_stats/economic_indicators/NationalAccounts/RegionalGDP_HOTPYeMar14.aspx. ^ "'Te Whiti o Rongomai'". Ministry for Culture and Heritage. http://www.nzhistory.net.nz/people/erueti-te-whiti-o-rongomai-iii. Retrieved 2014-12-20. Wikivoyage has a travel guide for Taranaki. This page uses content from the English language Wikipedia. The original content was at Taranaki. The list of authors can be seen in the page history. As with this Familypedia wiki, the content of Wikipedia is available under the Creative Commons License.